28700 Megan Dr, Bonita Springs, FL.| MLS# 216076576 | Southwest Florida Residential Real Estate for Sale. 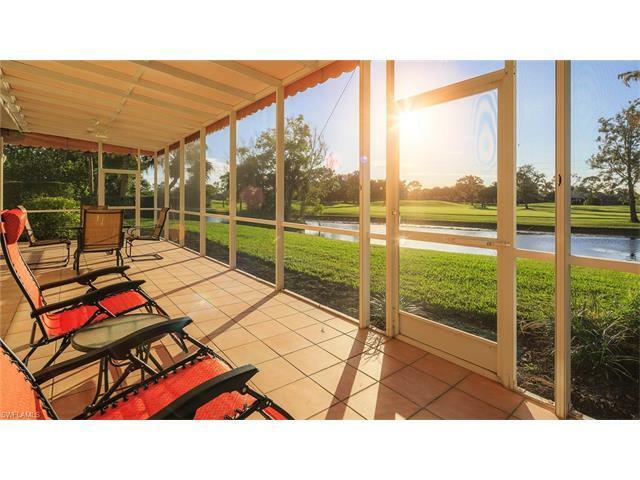 Most spectacular Westerly long-range sunset views around overlooking lakes and 3 golf fairways behind! This beautiful South courtyard pool home with a private cabana suite was designed for privacy and used to be the original developers personal residence. Located in the sought after Lake Club neighborhood, this spacious home was designed with openness and convenience to the large pool area as well as a long lanai at rear. A wonderful floor plan consisting of spacious Master suite, Guest bedroom with own bath and a screened lanai with a courtyard Cabana featuring kitchenette and bath. The Master Suite has a Jacuzzi tub with separate shower, and the living room is spacious including working fireplace as well as high vaulted ceilings. The Dining area is open to the Living Room and offers wonderful views to both the pool area and golf course. The location is close to shopping areas, post office, a number of banks and accessible to US41, Livingston Road and I-75. Spanish Wells offers a variety of memberships including beach access rights, but it is not required to join. Bonita Beach is only 3 miles away. © 2019, The data relating to real estate for sale on this Website come in part from the Broker Reciprocity Program (BR Program) of M.L.S. of Naples, Inc. Properties listed with brokerage firms other than Royal Shell Real Estate are marked with the BR Program Icon or the BR House Icon and detailed information about them includes the name of the Listing Brokers. The properties displayed may not be all the properties available through the BR Program. BR data on this website is provided by Royal Shell Real Estate on behalf of Anabelle Miller. The source of this real property information is the copyrighted and proprietary database compilation of the M.L.S. of Naples, Inc. Copyright 2006 M.L.S. of Naples, Inc. All rights reserved. The accuracy of this information is not warranted or guaranteed. This information should be independently verified if any person intends to engage in a transaction in reliance upon it. Data last updated 2019-04-19 18:05:28.